Independent Research Services Fees Born to be Found recommends a minimum of 7 hours research plus 1 hour for report writing. In some cases, where clients have already amassed information, a lesser charge may be considered. Local authorities and after adoption support agencies where clients are liable for costs must make payment at the time they request a search. 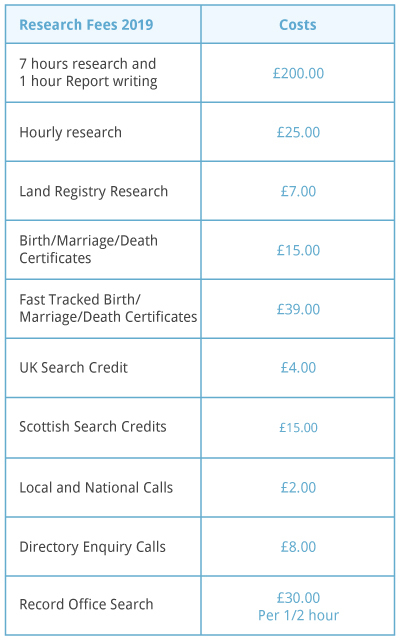 Local authorities and after adoption support agencies who are liable for costs must make payment within 1 calendar month from receiving a search report. The general public must make payment at the time they request a search. We accept cash or cheques. Our bank details will be given to those clients making over the counter deposits and for online banking purposes. A report will be sent by email to the client or relevant intermediary or support worker. A non-disclosure policy is in place when a birth relative is tracing an adopted adult. In this instance all findings are reported to the relevant intermediary or support worker. Adopted adults seeking a birth relative will receive a report based on findings within the public domain.